A team of scientists has created a low cost, fully printable solar cell that has remained stable in real world conditions for over one year, moving these record breaking solar cells from the lab to the commercial world. The solar cells were made from a special class of materials called perovskites. Perovskites are a type of mineral which, since being used in solar cells in 2009, have been championed as the 'next big thing' in renewable energy. These minerals have some interesting properties such as superconductivity, magnetoresistance and ionic conductivity which are really important for microelectronics. 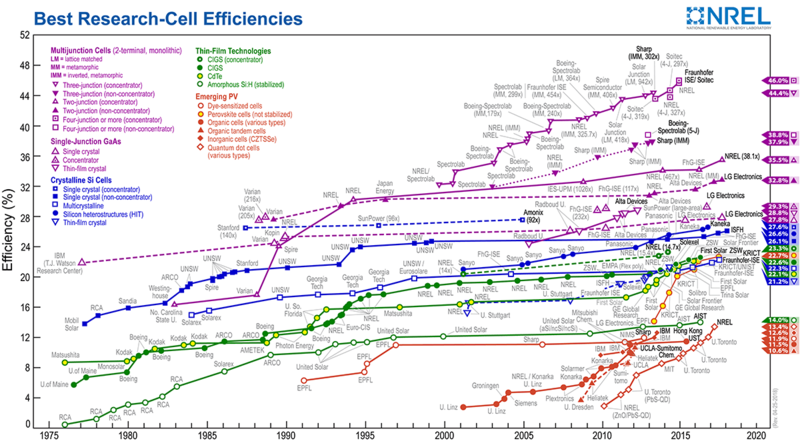 In 2016, perovskites were theorised to be capable of producing solar cells with a maximum efficiency of 31 percent – higher than even the best current commercial silicon solar technology. Although perovskite solar cells are easy to make and have achieved an efficiency of over 22 percent in the lab, once they are deployed in the real-world moisture and oxygen quickly destroy their solar harvesting capabilities. Similar fates have slowed the production of other printable solar cells based on conducting polymer technology capable of being printed on the same technology as polymer bank notes. Scientists from Switzerland have overcome this limitation by using a new type of perovskite solar cell structure to create a cell that has an operational stability of over one year at 11.2 percent efficiency – close to the typical efficiency of many silicon-based rooftop solar panels. The team created a hybrid 2D/3D perovskite solar cell. It used two different types of perovskites to impart two properties that are equality important for achieving long life efficiency – oxygen and water resistance, and charge transport. The 2D perovskite acts as a protective window against moisture, preserving the 3D perovskite's electricity generating ability. The two different types of perovskite were created with a simple wet chemistry method in a test tube and mixed together at various ratios to optimise the solar cell. "The important finding in this manuscript is identifying the presence of multi-dimensional 2D/3D interface," Mohammad Khaja Nazeeruddin, project leader from Ecole Polytechnique Fédérale de Lausanne, told ScienceAlert. "We believe [this] will trigger many further studies... widening the prospects for perovskite photovoltaics." The hybrid 2D/3D perovskite solar cells were made layer by layer, like a sandwich, by placing different solar cell 'ingredients' on top of each other. This solar cell that could last more than 10,000 hours under standard conditions and the maximum efficiency achieved by the 2D/3D perovskite combination was 14.6 percent. In the future, they hope that further optimisation of the internal structure of the device will continue to push perovskite solar cells much closer to their theoretical efficiency. "Further interface engineering by functionalised multi-dimensional 2D/3D interfaces, and preferential orientation of perovskite crystals would be the focus of our laboratory" said Nazeeruddin. Low cost, printable and long life solar panels are closer than ever and it looks like it's ready to leave the safety of the laboratory.